Arrival of My Delta Medallion Credentials! For most airline and hotel programs, including Delta, the elite year technically begins March 1, when status ends for those who did not requalify. Because of this structure, most programs wait to send out their elite credentials until late February. So while I hardly ever use my membership card and my luggage straps, but I certainly do feel important them. And having a few snack/drink vouchers is nice, despite the fact that it is possible to get these essentially 100% of the time that I fly. 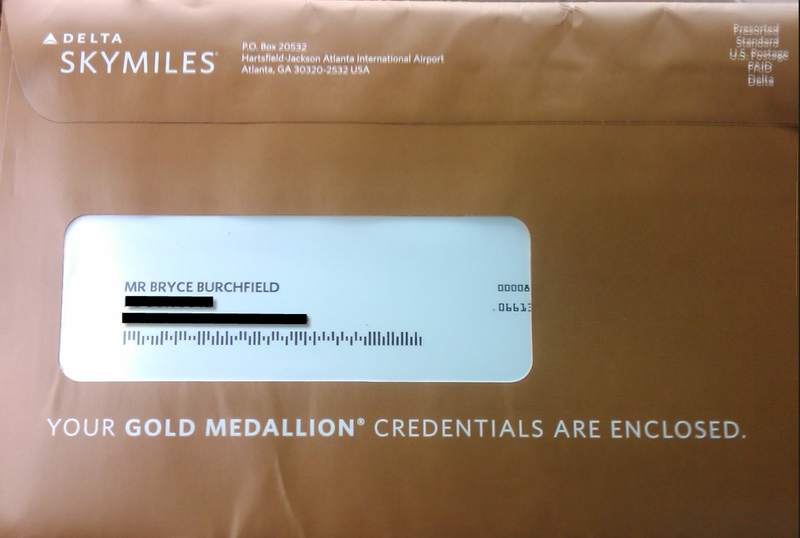 And it got me worried, maybe I missed re-qualifying for Gold Medallion status. No problem you say–yea, I would definitely miss a 50% complimentary, First Class upgrade percentage in addition to free Economy Comfort (domestic, at least) and access to SkyPriority security lines. To make sure, I logged on to Delta.com, thinking I may have been forgotten, and requested new membership credentials. However, it spent out an error message saying that new ones had been ordered for me, and that I would receive them soon. So, I will cut right to the chase about what made me most happy. As is usual, it came with 4 “Have One On Us” coupons. The nice thing is that they don’t expire until December 31, 2014. Considering I can easily conceivably get a voucher for every flight (by printing online… I might forget and print multiple copies…) so let’s see how many I actually. Who knows, I just may need to have another Delta voucher contest!